March 2013 a Minefield of Crisis or Opportunity? On March 1, 2013, the sequestration cuts (aka, seizure of funds) is to take place as I suspect certain political and other actors meant for it to do all along. The military budget cuts are touted by many in the media and on Capitol Hill as a dire situation which will make our nation "less safe" while the Republican Party has its gleeful knives out, for at last! the social safety net programs put in place by FDR and LBJ (both Democratic presidents, of course) will finally be decimated if 'all goes well' for the sour puss GOP. Sequestration relates back to the 'Super Committee' whose deadline for coming up with intelligent cuts and changes to the US budget failed to take shape by November 23, 2011 and so we have automatic 'sequestration' (austerity's handmaiden) to look forward to in March 2013 as domestic and military spending are reduced in an unprecedented fashion. Apparently Capitol Hill's wastrel ways, thievery, embezzlement, and heisting of our national treasury along with Wall Street and real estate fraud and lack of income tax payments due to unemployed or underemployed Americans have all take huge bites out of government coffers. When discussing larger amounts of money and the concepts of investment and growth, we look to planet Jupiter which turned Rx on Oct 4, 2012 @16Gem22, Stationed Direct @6Gem19 on January 30, 2013, and will move past his shadow (Rx) degree the third week of April 2013 as he heads for Cancer (good!) You may remember that Mr. Moneybags was involved as the apex (focal) planet in a disturbing YOD pattern along with the Saturn-Pluto sextile in the Winter Solstice 2012 horoscope. The horoscope you see below (if you're on-site!) is set for March 10, 2013 on Capitol Hill at the first minute that one side of the YOD pattern re-forms--the Jupiter-Pluto inconjunct (150 degrees)--with Jupiter reaching 8Gem48 (2A29.) This also means that the recurring Jupiter-to-US-natal-Uranus (8Gem55) transit is in force so the YOD with Saturn-Pluto at its base has two planets to pressurize just as in the Winter Solstice 2012 horoscope though Saturn and Pluto have advanced to 11th degrees. 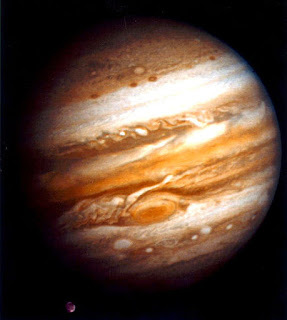 Another difference, of course, is that March 2013 will be a busy month in Washington and Jupiter is now direct and can trigger the 2012 YOD into action. 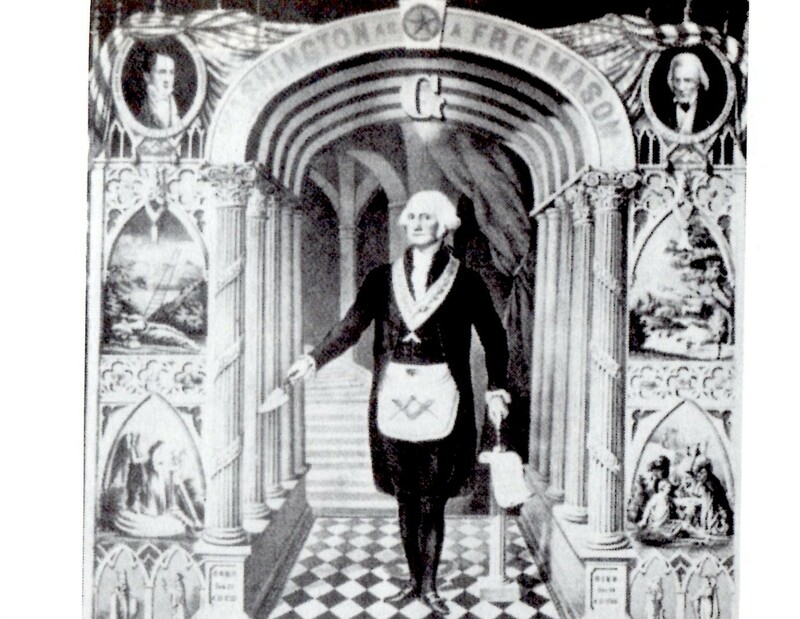 Hour Venus (15Pis53) posited within a full 8th house of Debt, Credit, Shared Finances, Corporations, Legacies, etc. Venus is exalted in Pisces due to her sympathetic nature being brought out on a Higher Plane and she inspires creativity yet over-indulgence and extravagance with money may also be noted. Chart-ruler (ASC 7Leo43 conjunct US natal NN) is the Sun @20Pis23, also in 8th house as are Neptune, Moon, and Chiron, all in mystical Pisces. 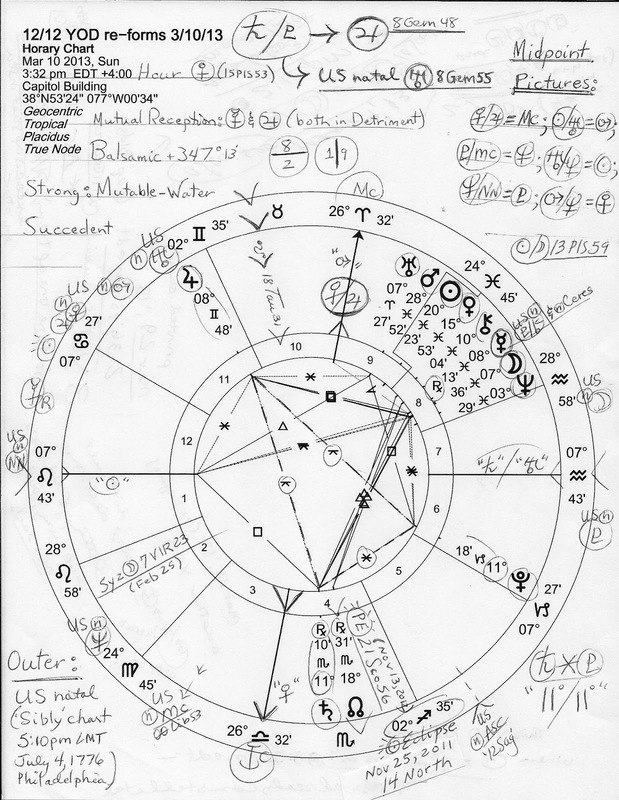 However, 8th cusp = 28AQ58 which makes Saturn and Uranus determinates of such a busy if confused or deceptive 8th house of Corporate and other Finances and ties in the YOD energies thanks to Saturn in Scorpio. 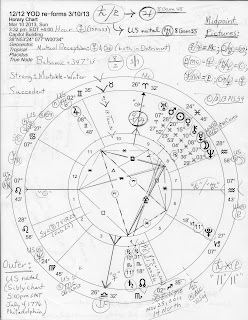 Click the image to enlarge for America's natal planets are penned around the outside of the chart--as you see, US natal Moon is just over into 7th house, and Mars 28Pis52 and radical Uranus 7Ari27 are in 9th house of Foreign Lands; both 7th and 9th houses have legal implications and of course, the 8th house does as well through wills, business contracts, pacts and treaties. So besides Spring Equinox 2013 (Aries Ingress) on March 20th, the horoscope of which also contains the YOD, during the last week of March 2013, transit Jupiter will move closer in orb to perfecting the YOD configuration (11Gem29 on March 29th.) 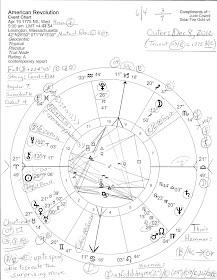 This naturally places tr Jupiter on US natal Descendant (Sibly chart) of Partnerships and Open Enemies, and the Saturn-Pluto midpoint on America's natal Ascendant, a picture which encapsulates much of the financial and social potentials for loss, cruelty, hardship, and melancholy under which our 'lurching from crisis to crisis' government has been play-acting against us as benefit cuts threaten those who can ill afford them and a re-recession looms over our heads. The picture also details the suffering and grief the American people are sustaining through Congress' haphazard way of governing and our nation's loss of public status as the GOP embarrasses itself one more time and 'attacks regardless of potential losses'. Yes, everyone wants to blame Tea Party congress members and their billionaire backers for gumming up Congress with obstructionist tactics against a Democratic president yet I must blame them all (save two or three Democrats and perhaps an Independent or two.) The Republican Party could do better if it wanted to, imho, and this isn't the first time they've behaved like royal jacka*ses to force their old timey agenda and implement their long term dream of ripping apart our social fabric. So! You may wish to set up charts if you haven't to check out the Moon-Saturn conjunction @10Sco17 (2:12 pm edt--our clocks move ahead one hour on March 10 @ 2:00 am) on March 29th @ 2:12 pm edt for Luna conjunctions work well as a timing device. In fact, the last days of March show two, three, even four YODs of crisis/turning points forming if you'd care to have a peek at what's coming at us. Things won't be easy even if 'lawmakers' were behaving aboveboard!